Introduction: Using RCT’s in the real world gives the opportunity to bridge the gap between measuring intentions and real world behaviour. There are however many complexities accompanied by setting up randomized controlled trials for real world contexts, as for example the inherent constrains as randomizing, measurement and using comparable environments. These constrains can be so profound that real world RCT’s are impossible or at least too expensive to carry out. Some solutions to these constrains have been found in virtual reality. 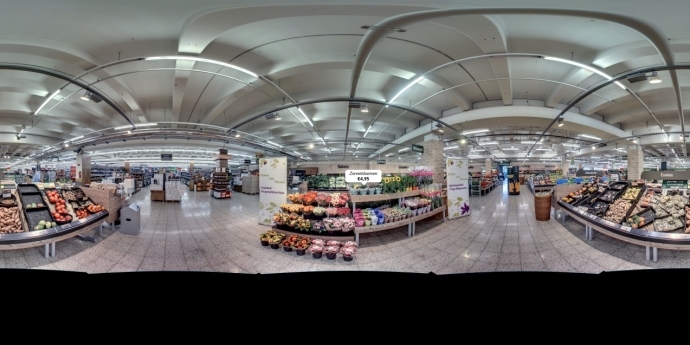 Using VR simulations has shown to be a good alternative in consumer behaviour research. The simulations are able to set up a clean experimental set-up where only the factors of interest are changed in order to compare their effect on consumer behaviour and meanwhile the participant’s behaviour can be automatically tracked. Although virtual realities offer a solution to setting up RCT’s, there are a number of drawbacks in using these virtual realities. Most VR-methods are (1) not easy to operate for the consumer, (2) costly in time to build, (3) unrealistic due to the complexity of 3D products, and finally (4) often based upon a single context. Aim: The aim of the current tool was to improve on the already existing virtual supermarket and create a version that easy to operate for consumers of all ages above 18 years old, quick to build, with very realistic projection and finally, more easy to change to a different context. Development: Realism was of crucial importance and the level was set high by using flowers are the first product of investigation. Flowers are inherently a visually oriented product and have a complex shape by nature. In fact, nothing simulates a flower better than an actual picture of it. Using a picture was the solution to two of the issues at once, firstly the realism was as high since we used a picture of the real product. Secondly, the development costs went down since we used pictures of the whole environment at once. A picture of the set-up is shown below. Note that the picture looks out of perspective since it was made for 360 view on a head mounted display (Oculus Rift DK2). The ease of use for the consumer of the virtual simulation software plays a pivotal role in the validity of the results. While several researchers have used and validated virtual simulations in behaviour research [1-3], ease of use shows to be sub-optimal in most applicable set-ups. Simply put, moving around in a virtual world is not as easy as moving around in the real world, which has its effects on the results . To overcome this issue in the development of this method we used a consumer oriented approach. In practise this meant that the choice process was set as the fundament. All other aspects such as the hardware, data-collection and the instruments were built in such a way that it supports the choice process. The whole simulation was designed around a single button interface. This made it as easy as possible for the consumer to make a choice. In the choice process the consumer only needed to put on the VR glasses, look at the product of interest, and push one button. Placed below is an example of the customer journey. Afterwards a simple questionnaire was filled in by pencil and paper. Another significant aspect of a research tool is how the data can be used and interpreted. The data was saved at the individual level in order to be used in two consecutive parts. First, the behavioural data was saved individually per user. 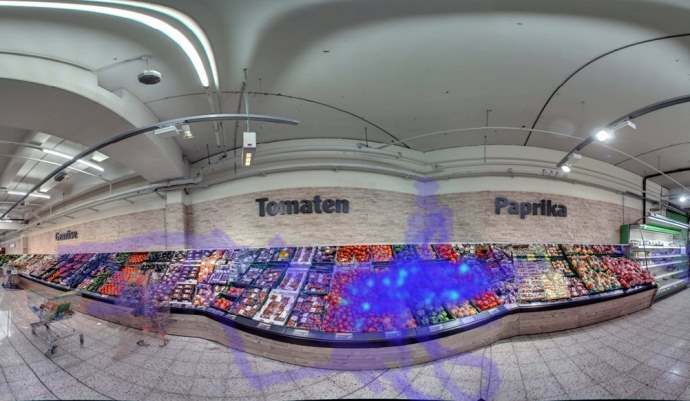 Not only the chosen products and treatment information is stored, also a heatmap of gaze direction is saved which enables the researcher to see what the individual consumer looked at. Second, the data can be aggregated in two ways. An overlay of gaze direction can be made and projected upon the virtual environment. Due to the individual heatmaps, overlays can be generated per consumer segment, which can also be generated post-research. Furthermore, all the choice data are aggregated and connected to other data like demographics and psychological constructs. Statistical analysis and the visual inspection of the data gives an holistic overview of the results. An example of a heatmap is given underneath. Note that this is fictive data due to confidentially agreements. Conclusion: The feel of realism and ease of use play a fundamental role in simulation RCT’s, by staying close to reality the the insights get as close as possible to reality. For this tool we tried to overcome the usual drawbacks by developing a method that is 1) easy to use for the consumer, 2) quick in development and versatile use for multiple contexts, 3) very realistic and (4) due to the flexibility the simulation can be used for a whole range of environments. By applying state-of the art technologies meant for the consumer market (Oculus Rift and Unity) and implementing them in a more commonly used experimental designs we managed to produce a quick and realistic method to pre-test multiple treatments before applying them in the field. 1. 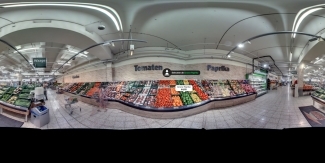 Waterlander, W.E., et al., Using a 3D Virtual Supermarket to Measure Food Purchase Behavior: A Validation Study. Journal of medical Internet research, 2015. 17(4). 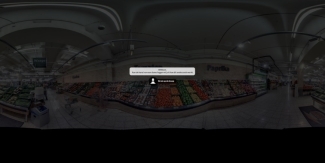 2. van Herpen, E., et al., Using a virtual grocery store to simulate shopping behaviour. 3. Vlaeminck, P., T. Jiang, and L. Vranken, Food labeling and eco-friendly consumption: Experimental evidence from a Belgian supermarket. Ecological Economics, 2014. 108: p. 180-190. 4. Desmet, P. and J. Traynor, Systematic differences in test results across real vs. virtual shopper laboratory stores. 2010, Paris Dauphine University.